Rusks must be brittle and completely dried out to be done. They also last for ages this way. One tip on drying is that the thicker the rusk, the longer it takes to dry – that’s obvious I guess. Less obvious is the denser the rusk in terms of ingredients (the more ingredients the more dense), the longer they take to dry. I also tend to let rusks that have moist ingredients like raisins dry for longer. The lowest my new oven goes is 170 degrees so my drying time is less than previously. Bottom line is you have to check after about 4 – 5 hours. Tip: The rusks are sufficiently dried if, when you press them between your fingers, they feel solid. If they feel at all spongy dry them out some more. Place the individual rusks onto a baking tray leaving spaces in between each one. For the recipes on this site you will need two baking trays – at least one of them large sized. Leave to dry overnight at about 100 – 125 degrees. If you turn up the heat you will burn the edges of the rusks without really drying them out. I dry my rusks on a wire cooling rack. Takes about 3 hours in a thermofan oven at 100deg.C. Leave the door slightly ajar in order for the moisture to escape. OK ……. I’m in the US so using a F scale. The lowest my oven goes is 175F. After my loaves were fully cooled, I sliced about 1″ slices then into finger-sized pieces. I put them on a baking sheet and dried at 175F for 1 hr. BUT I had a LOT of loss in my initial slicing. What am I doing wrong? . Cut in half whilst in the pan. Lay a bread board over top of both halves and flip so that you have it right side up. Using a finely serrated knife, cut into the hardening crust just to break the crust. Cut strips about 1 inch wide. Using a smooth, sharp knife, cut right through following the tracks of the serrated knife. Following the same knife act, cut across the strips into about 1 inch pieces. Are there any rusk recipes that don’t require drying out in the oven? Feel guilty about leaving the oven on for so long with electricity shortages. Don’t you think that having the oven on at 100C does not really take a lot of electricity? (oven doesn’t need to work that much). I think it’s such less then you’d think. This is my second try at rusks but my first try in the USA. it was hard to find the exact ingredients but I think I got it right but when I took them out of the oven the first time and I waited 5 minutes and then cut them they crumbled terribly. The inside ones weren’t bad and I’ll dry then overnight tonight but what did I do wrong that the outer ones crumbled when I cut them??? This American who loves rusks from South Africa needs help!!!! 1. Use a finely serrated knife for cutting the rusks, and start at the edges of the pan using a “sawing” motion to gently break into the baked dough.Then use short, “sawing” strokes as you cut through the length of the pan, rather than dragging the knife and causing a stress on the fragile dough. 2. If you do have lots of crumbs, don’t throw them away – they’re delicious as toppers on apple crumble, or with yoghurt or icecream. That way you still enjoy the rusks you worked so hard to bake. Let us know how the next attempt goes. Good suggestions. Thanks. I also use the crumbs in the mix for apple crumble. I’ve discovered two ways to make the cutting easier: cut the dough right through at the intervals you require. I like 3cm by 3 cm. When it’s baked through it it’s much easier to work your way through the baked dough. You can also buy, at baking stores or markets (Irene market in Pretoria) a metal divider, similar to the one that used to come with the ice tray,which you place into the dough before baking. That automatically does away with cutting – and also with crumb wastage. t’s quite pricey and I’ve never got around to buying it, but that’s what the pro’s who supply Home Industries etc use. I use a pizza cutter to cut through the dough before baking. When the trays come out of the oven I let them cool down and then cut again along the same grooves as before. The rusks can then be seperated easily and wastage is reduced. Great technique, At. Thank you! how can i dry rusks in a gas oven ? Mmmm. I’ve never used a gas oven. Hopefully someone following this blog has a good answer for you. Have you tried searching the internet? There must be people out there who have used a gas oven to dry food. I did a quick search – nothing extensive – and found this: “The temperature is warmest closest to the heating element. If you have a gas stove with a pilot light, that may be enough to give you the temperature you need. The way to check is to put a thermometer on the top rack and close the door. Check in an hour and see what the reading is. If it’s not high enough, you’ll need to turn the oven on warm. Check the temperature after half an hour.” There’s more on this site but I don’t know if it answers your question as I didn’t spend more time digging. Gas ovens also have temperture control. I made rusks in the U.K. using a gas oven. Set the temp at about 100C or about 150F or nearest. You will need to keep an eye on it to ensure it works for you. I prefer gas ovens and cooking tops to electric. I put my rusks in my gas oven on the lowest setting, which was 1/2(half), for 3 hours with the door slightly ajar. Then switched off the oven and closed the door. 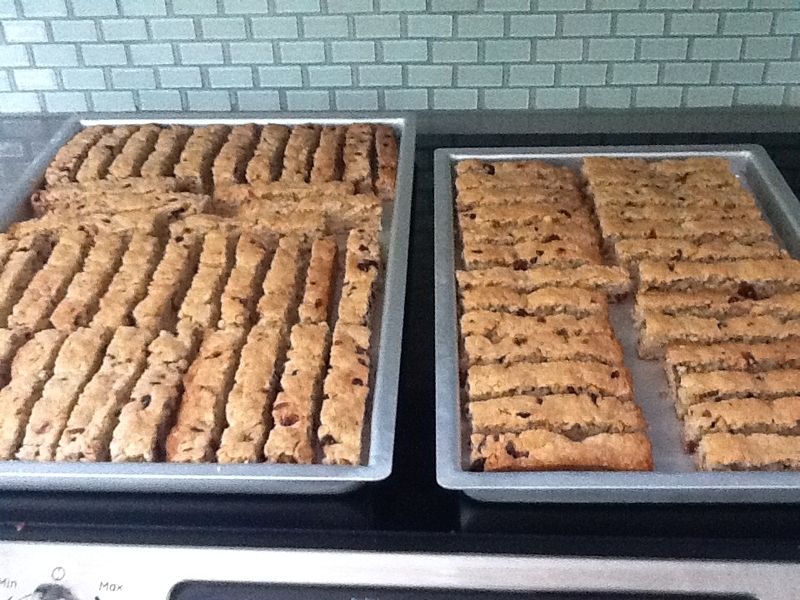 A few hours later, once cooled, I did exactly the same thing again…Half setting for 3 hours with door ajar. They came out perfect, without any burning at all. Great tips! Thanks for sharing those. I’m sure others with gas ovens will find this helpful. I make them the way my mom taught me. Instead of putting the whole slab of dough into a baking tray, I roll balls and just put them in the tray touching each other, that way when they are cooked they are all individual and you just gently just pull them apart, they usually tear really easily and I find it’s much nicer to dunk an imperfect rusk rather than fingers. If anyone is familiar with ouma rusks from South Africa then that is what they look like. Anyone tried drying the cooked rusks in a microwave? Hi Lyn. I’m not sure how convection microwaves work but the standard microwaves will not dry rusks. Have you ever tried warming up pastry or pizza in a microwave and noticed how soggy they become? I believe the same will happen to the rusks. But….I’ve not tried! Not that I know of. You could try putting them out in the sun like they do with pumpkin seeds but you need a very dry climate and you’d need to put netting over them to keep flies off (of course they would have to be baked first). Or you could try in a biltong dryer or a food dryer. I’ve not tried any of these methods but hey, if it works let us know! Help my ruska are burning before they can dry out. I am not sure what I am doing wrong? This is my first time making them. Am I supposed to leave the oven door open or ajar, when I,am drying them out? Oh dear. It sounds like your heat is too high. I set my oven to it’s lowest possible temp for drying out and leave it like that for 5 – 6 hours. They shouldn’t burn at that low temp. So I have a problem. My modern oven switches off the moment the door is ajar. Any ideas how to dry my rusks? I never leave the door ajar. The rusks dry out with the door closed. You can, at some point in the drying, open the door briefly to let the steam out but I sometimes forget to do that and the rusks dry just fine. Why would the rusks be too hard and not really brittle enough? I’m afraid I don’t really know. If you live in a very sunny, dry and hot place you can try drying them in the sun like you would dry out fruit. I’m sure that’s what the old Voortrekkers did! Good evening, i have a 100% gas stove. With load shedding and all a good choice. the only problem I encounter is drying rusks. the lowest temp on the oven is 180 degrees Celsius. someone spoke about a pan with washed river sand in the bottom. what about sliding a pan or 2 inbetween the rusks where they dry. It should devide the heat? Please help with a solution. 2 heads are better than 1. Wow that’s a pretty hot oven. I hope someone can provide you with good advice. I have an electric oven so unfortunately I can’t help you. Great idea! If you try it let us know how it goes. If you dry rusks and it turns out wasn’t long enough when you get to eat them, can you go back and dry them more? Yes, I’ve done it before and it worked out fine. I also have a problem drying out rusks in the oven because of the electricity usage. A thermofan oven definately helps. I just want to put something out there…… what if you lay the rusks on a baking tray once baked and let a strong fan blow on them for about five hours? Thanks for this suggestion. If anyone has tried this hopefully they will comment too. Why not give it a try and let us know? Hi, just baked some health rusks with seeds, bran and raisins, all things that normally lead to a lot of crumbling. But the recipe said a had to dip a knife in hot water and cut the dough in the pan into the shape/size I wanted the baked rusks to have. It worked fine. I repeated cutting along the cutting lines before removing the warm rusks from the pans and they came out with less crumbs. Next time I will even cut them in smaller rectangles to use less time for drying. Thanks Saretta! We love to hear suggestions from people who have tried something and it’s worked. Try using an electric knife? I also have a problem with my gas stove. I’ve started baking to earn some extra money, but can’t dry the rusks as the lowest temperature on the temperature control knob is 140 degrees Celsius. Which means the real temperature is plus minus 160 degrees. It’s a gas stove with an electric grill. When baking the heat only comes from below. The rusks bakes perfectly but then I can’t dry them! I’m so frustrated. Someone, please tell me that there is a solution to this problem. Not even the manufacturers of the stove (La Germania Bertazzoni) seems to be able to suggest a solution. I’ve tried a microwave. Small amounts of rusks at short burst of drying 1 min @100% and then stand fo 1 min. Repeat until crunchy as toast! Yip it’s time consuming. I also dry my herbs in micro wave and let them sit on a kichen towel on the counter to complete proses. What a great idea, Amanda. I’ve not heard of people drying anything in a microwave. In my experience things go soggy in the micro. When you say you let them stand for 1 min. is that with the microwave door open? Also, how long do you microwave your herbs for and what quantity of herbs are you drying at one time? Hi why are my rusks sometimes hard and difficult to soak when dunking? I’m not sure exactly, but when this has happened to my rusks in the past it’s been because my dough was too wet and then I had to dry it out for a really long time. The wet dough is then more dense, less porous, and therefore harder. I’m not familiar with the oven you mention, but I dry mine on the lowest temperature of my oven, with the door closed.